On Saturday, September 29th, a team of NHLPA staff participated in the second annual Road Hockey to Conquer Cancer (RHCC) tournament, which is the largest road hockey fundraising event of its kind. From dawn-to-dusk, over 650 thirty minute games were played and approximately 39,000 shots were fired on net. Now that’s a lot of hockey! 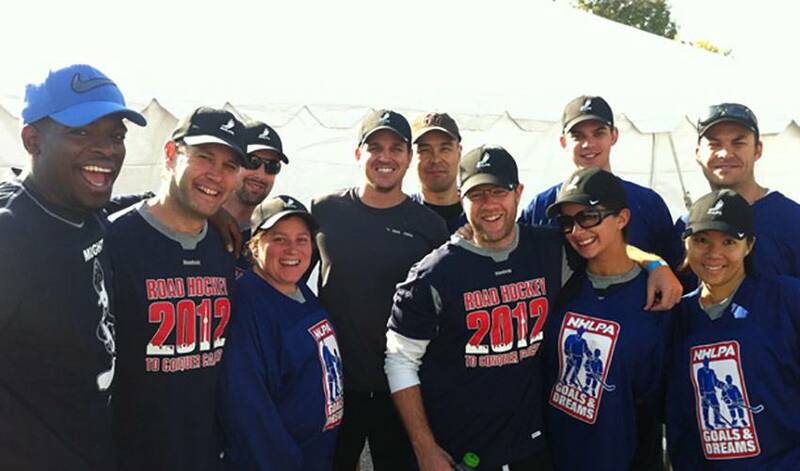 Over 50 celebrities came out to the tournament including several NHLPA members (P.K. Subban, Matt Frattin, Jake Gardiner, David Clarkson, and Michael Del Zotto). Team NHLPA raised over $12,000 and donated signed memorabilia to the event’s silent auction. Though we didn’t win, we’ve been told we had the coolest hockey sticks by far. In the past two years, RHCC has raised five million dollars, with over two million of that amount being raised this year alone. All proceeds benefit the Princess Margaret Hospital and the Canadian Cancer Society. If you’d like to donate for the year 2013, please visit Team Up To Conquer Cancer. Below is a sample of #RHCC tweets from those who participated. What a great day! Tweets from the Road Hockey to Conquer Cancer 2012 fundraising event on September 29th, 2012.